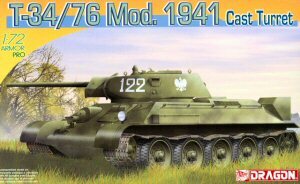 Six months after releasing their excellent Model 1941 T-34 with welded turret, DML has now added to their family of "34" tanks by adding a model of the most common version, the Model 1941 with cast turret as produced at Factory No. 183 after moving to Nizhniy Tagil. I still continue to point out to companies like DML that the Soviets never called these versions "T-34/76" tanks, as that was a German description; the Soviets never added any digits until the 85mm tanks appeared in 1944. In point of fact, many Soviet era documents show that the tanks were only differentiated by their number of turrets (as with the T-26) or gun carried (here either L-11 or F-34). The Soviets dubbed later tanks T-34-85 to show the differences. This is the second of the DML Model 1941 tanks - T-34 with 76.2mm F-34 gun) - and does a nice job of adding the cast turret to this kit via a new sprue. It uses the later, more widely produced hull with longitudinal grilles, now taken from DML's Model 1942 kit. Again, one of the most impressive tricks is the use of what DML calls "slide-molding" in which multi-part molds with moving parts are used vice the older "sandwich-type" two piece molds. As a result, they can do larger pieces without either ejection pin marks or sinkholes, and get depth or undercuts in smaller parts. This shows up in this kit in two areas: first, the fact that even in this scale the gun barrel for the F-34 cannon has a hollow muzzle as molded; and second, the wheels come in 14 ready-to-install assemblies vice 28 separate wheels and perhaps axle caps. The wheels are nicely done, with a nice deep grove in between (unlike another company's 1/72 scale kits with solid road wheels or most HO scale armor) and detailed on both sides. Purists will want to drill out the thin flash in the drivers (parts C2) and idlers (parts C1) though, but that is an easy task if you have a pin vise and small drill bits. The modeler has a choice between either a solid styrene radiator exhaust grille or one with an etched metal grille instead. Whereas the first versions produced appear to have had some errors in them and would not fit, the newer ones show the grill is the right size and shape and only needs its rear edge "rolled" over a drill bit prior to installation. The turret also includes a partial interior as well. Most of the details parts are crisp and well done as well; note since this kit uses the Model 1942 sprues, it comes with most of the same accessories that were miniaturized from the old Tamiya Model 1942/1943 kits. The kit provides single-section tracks as before, but DML has now changed over to use their DS plastic vice the original black vinyl. This means that standard plastic cement can be used to assemble them and get them to "sag" on the model. However, some modelers indicate these tracks may be a bit short; unlike the 1/35 scale kits that provide an eccentric idler axle that can be used to adjust tension for shorter tracks, the idler mounts on the 1/72 kit are fixed and thus care is needed in mounting the track on the model. The kit comes with finishing options for six tanks: 1st (Polish) Tank Brigade, 1945; unidentified unit, Winter, 1943; 8th (Estonian) Infantry Corps, 1943; unidentified unit, 1943; "Parkhomenko", 116th Tank Brigade, 1942; and "Bars", Manchuria 1945. Overall, this kit continues to build on the excellence of the previous kit. DML now only needs to make an "STZ" version of the Model 1941 to complete the basic early model tanks.